This is the second lesson in Jo Boaler’s “How to Learn Math (for Students)”. Carol Dweck’s mindset model says there is a “Growth” mindset, where students believe they can improve with hard work, and a “Fixed” mindset that believes that people are either smart or not and that can’t be changed. It’s not uncommon to have a growth mindset in some areas (like sports) and a fixed mindset in others (like math). When it comes to math, those students who have a growth mindset consistently outperform those with a fixed mindset. This is because mindset influences behavior. People with a growth mindset persist until they succeed, and see mistakes as feedback. Ironically, praise for being “smart” can lead to developing a fixed mindset! It leads students to shy away from difficult work so that their self-image of being smart isn’t challenged. However, student that are praised for being hard workers had a growth mindset. They wanted to reinforce their self-image as “hard workers” and so picked more complicated problems to do. It is important that students choose demanding tasks, because their brains grow the most when they struggle. One study had teachers gave half their students a note with their feedback that read, “I am giving you this feedback because I believe in you.” Those students achieved at significantly higher levels than the students who didn’t get the note with their feedback. As teachers, it important to give our students the message that we believe in them and expect high things from them. In my previous post, I talked about Stanford’s MOOCs. I decided to register for Jo Boaler’s “How to Learn Math (for Students)”. There is a teacher version, but it is not free, so I thought I’d take the student version to see what I can learn. To counteract the assertion that “some people are just better at math,” Boaler directed us to the article “Teaching the Brain to Learn”, which posits that the “distributed neuro functional systems,” which are the basis for later cognitive ability, can be shaped by the type of activities students do. It also stresses that emotions are connected to learning as well, influencing the affective filter in the brain. This is why emotionally meaningful experiences lead to students improving their cognitive abilities, while emotionally stressful situations can disrupt the learning process. Student engagement is the key to enhancing outcomes, which is why project based or discovery learning can have great results, as long as it is rigorously structured. Otherwise, the outcomes are no better than direct instruction methods. We then were watched a series of videos. The first asked people “What do you think about Math? Why?” and then reflect on the people who didn’t like math – what turned them off? Some said they didn’t know how it related to the real, physical world or how it was applicable to their lives. Some said there were too many rules to memorize, or that it was boring and too repetitious. Next was smashing math myths, and how the brain works. Math isn’t just in textbooks, but living, breathing math is all around us. There is no such thing as a “math person” – everyone is a math person, and everyone is born with the innate ability to do well in math. What we think of as “math people” are that way because of the experiences they have had. You can catch up to brainy people! The brain is like a muscle, the more you work it out the stronger it grows, but you have to keep increasing the “weight” which means the more you struggle with an idea, the more your brain grows. The brain is very plastic. London taxi drivers have to learn so many streets – twenty thousand! – that their hippocampus actually grows bigger. Interestingly, once they retire and are not accessing this information any longer, the hippocampus shrinks back to its original size. A seven year old girl who had half her brain removed was able to teach the remaining half to take over many of the tasks of the missing hemisphere. In one study, students worked on a task for just a few minutes each day for 6 weeks. 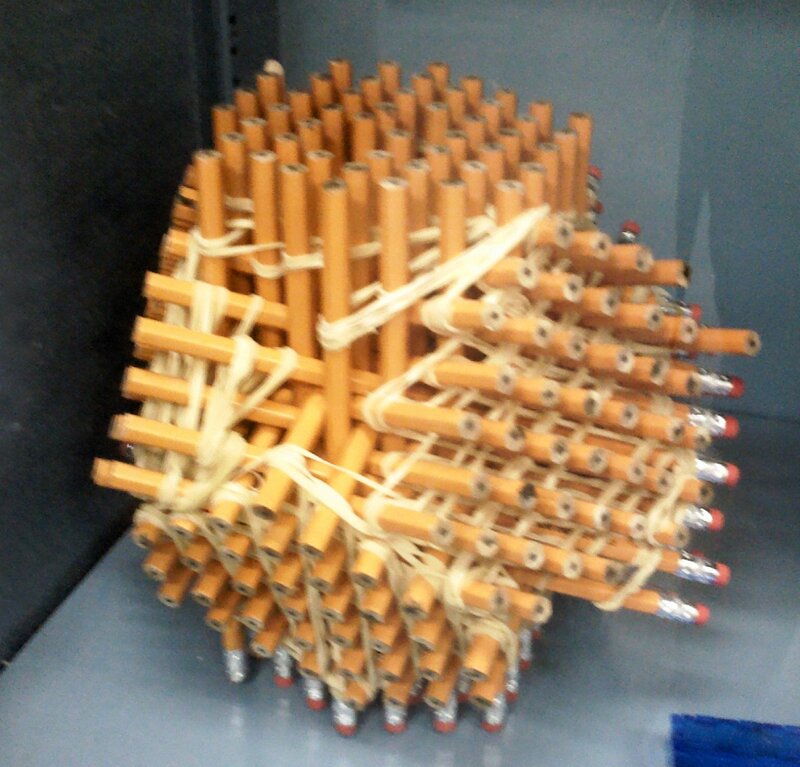 At the end of the study, they had changed the structure of their brains. There is a stereotype that math is “for boys.” Unfortunately, that is reinforced by the kinds of toys that are marketed it for boys. 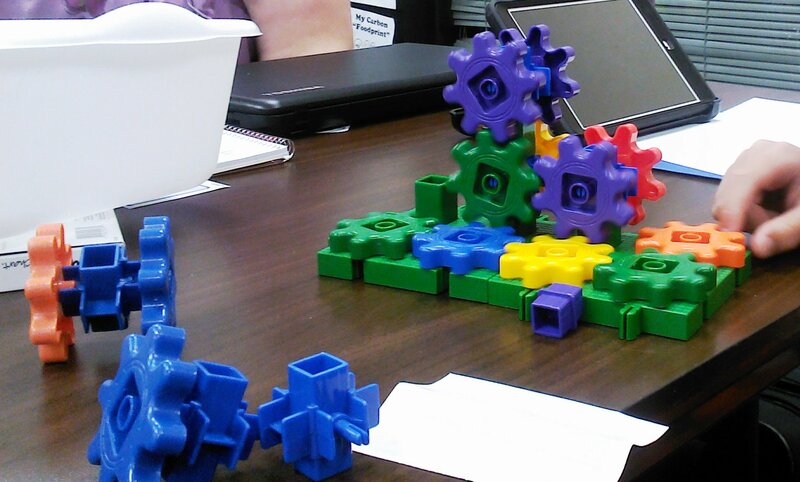 These are the type of toys – building toys and strategy games – that help build the math part of the brain. Stereotypically “girl toys,” such as dolls, don’t do this. Always resist stereotyped thinking. Always. The ideas in the world are for everyone. 1) The brain is plastic. It can grow based on how we work it out, and those things that we struggle with and are challenging build it more. 2) Certain activities and games, such as origami and backgammon, can help develop our math ability. 3) There aren’t “math people” – everyone is a math person. It is possible to catch up to the “brainy” people. Always resist stereotyped thinking – Always! For my final post about my Intro to STEM class, I wanted to sum up what we learned about designing a STEM lesson. Never forget that students are the center of the learning process, and every lesson should be guided discovery. Be careful of giving them the answer or telling them what they should be getting out of the lessons. Make projects central rather than peripheral to the design – projects aren’t an aside, but rather ongoing and central part of the learning process. Make sure that projects are broken down into manageable pieces – the younger the student, the more breaking down/scaffolding needed. Structure it and tier it in the classroom (not “here’s the big project, go do it, turn it in three weeks from now”). Projects must have real-world relevance. Start by taking an idea and building a unit around it. Projects should conclude with a product or performance task – a project, a product, a presentation, a poster. Something to show for all the work they’ve done. Use digital technologies to support and enhance student learning, but don’t forget that thinking skills are an integral part of project work. Use varied instructional strategies that support multiple learning styles, and include ongoing and varied types of assessment. Homeschoolers on eBay are a great resource as they buy good material and then sell it when they’re done. For an (admittedly expensive) intro to robotics, check out The Lego Mindstorms series of kits. The Maker Education Initiative is an organization devoted to project based learning, in particular “making” a product. A representative observed our solar heater project and said that’s what Maker Ed is about. A MOOC is a Massive Open Online Course – in short, free classes that anyone can take. Find MOOCs at Coursera. Stanford University also offers MOOCs, including those by the amazing Dr. Jo Boaler. 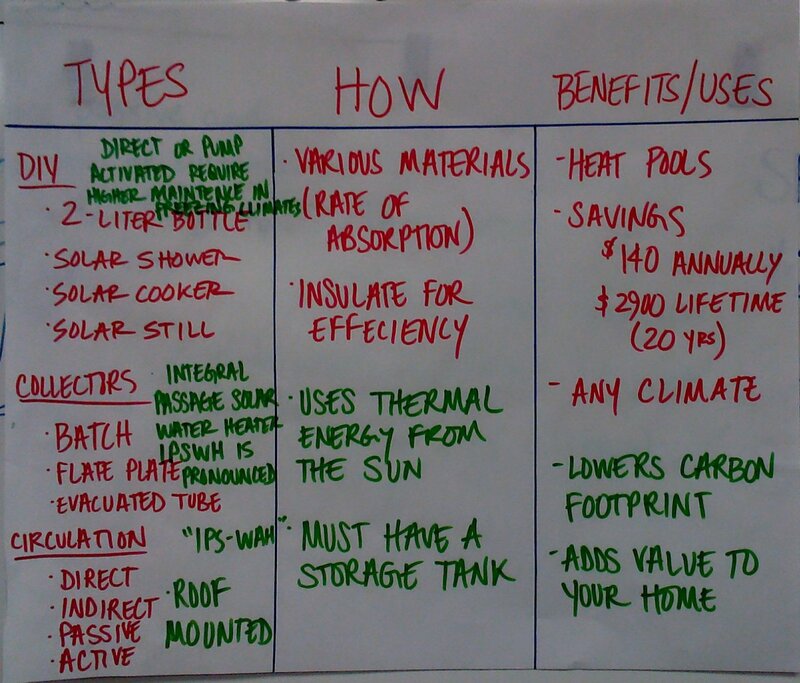 For the final unit, we studied solar heating in general and solar hot water heaters in particular. 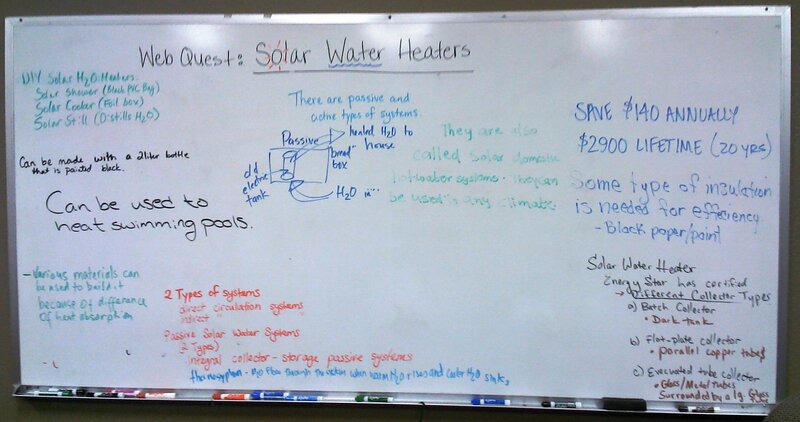 Working individually, we started with a web quest researching solar hot water heaters. As a teacher, think about what question to ask so that the students aren’t landing on the same webpage and thus sharing the same info. Alternately, give them the search term and assign groups to report on the first page of results, second page of results, third page etc. After fifteen minutes, we wrote our facts up on the white board. Next we were put into pairs, and each pair decide how to sort the facts written (make their own categories) and then add two more each, and make a poster with this information. This makes students think about all the shared information, since students tend to want to interact only with the portion they are responsible for. We then shared out our new information. Another group’s sort, with the new facts in green. 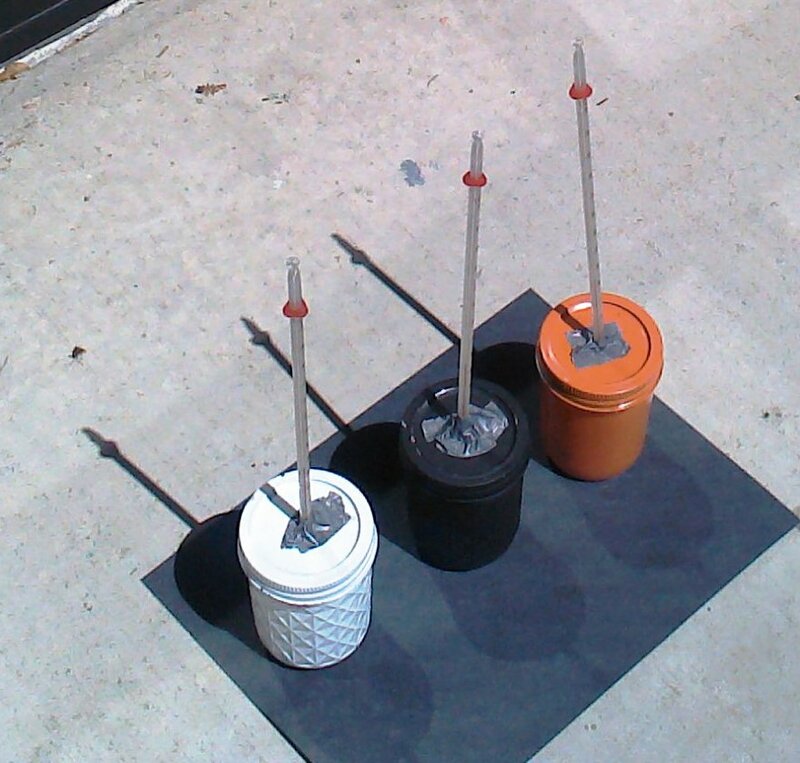 To see if different colors absorb solar radiation at different rates, we did an experiment. We were given mason jars painted with different colors: white, orange, and black. We filled the jars with equal amounts of water and took the starting temperature of the water. We then took our jars outside and placed them in the sun. We took the temperatures of each jar at even time intervals and recorded the results. 1. Beginning ideas – What are my questions? 2. Tests and Experiments – What did I do? 3. Observations – What did I see, hear, smell, feel? How did I measure what I observed? Graphs and interpretation of graphs of any data collected. 4. Claims – What can I claim as a result of my observations? 5. Evidence – How do I know? Why am I making these claims? 6. Reflection – How have my beginning ideas changed? 7. Redesign or Extension – How can I use my new ideas to improve my design (engineering) or investigate something new? We also had to graph the temperature vs. time data for each colored jar on the same axes, and use the graph to address the question, “Does the color of the jar make a difference in the heating of the water?” making sure to support all claims with evidence. There are many possible extensions to this experiment, such as: type of heat transfer (radiation, conduction, convection), estimating temperature at certain time, Newton’s Law, graph analysis (curve fit, find the linear functions): will it eventually plateau and would they all be the same? We did a graph analysis using TI-84 graphing calculators to graph and do a regressive analysis of the data. I want a class set of these calculators so badly!! 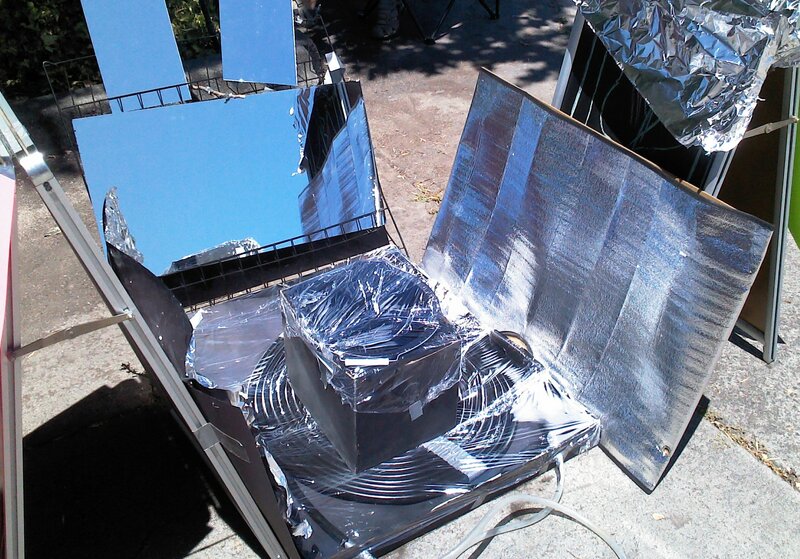 Finally, we were put in groups of four to build a solar water heater to increase the temperature of 1 gallon of water as much as possible in 45 minutes. We brainstormed in groups and came up with a design. We could bring anything we wanted from home, but we were limited to spending no more than $10 on the project. We would have ninety minutes to build the next day, and then after our lunch break we would test our designs! 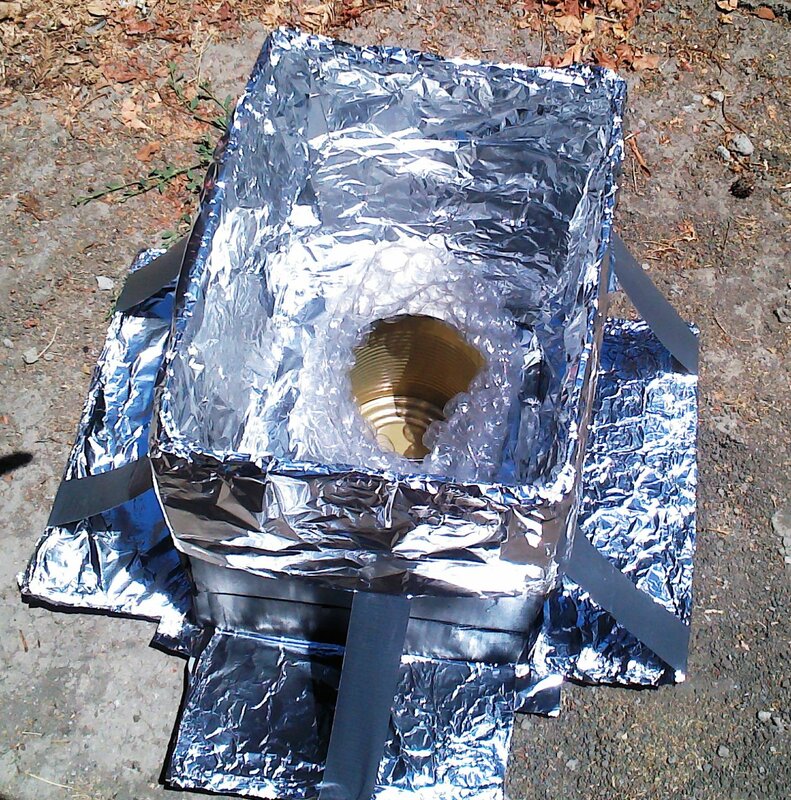 The first group’s was a solar reflector-type, with a gallon can in the center for the water, insulated with bubble wrap. Group two used a coiled black hose, and a gravity siphon to circulate the water. The third group used reflectors focused on an aquarium which would function like a greenhouse. 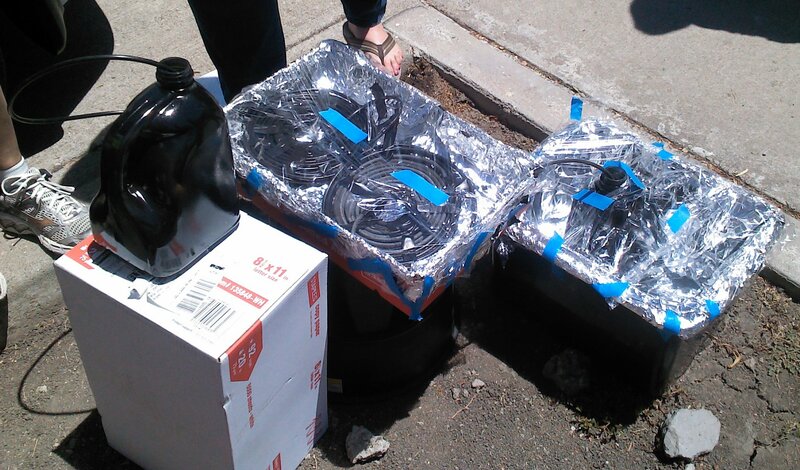 Our group used a coiled black hose, with a pond pump to circulate the heating water. We also used solar reflectors. 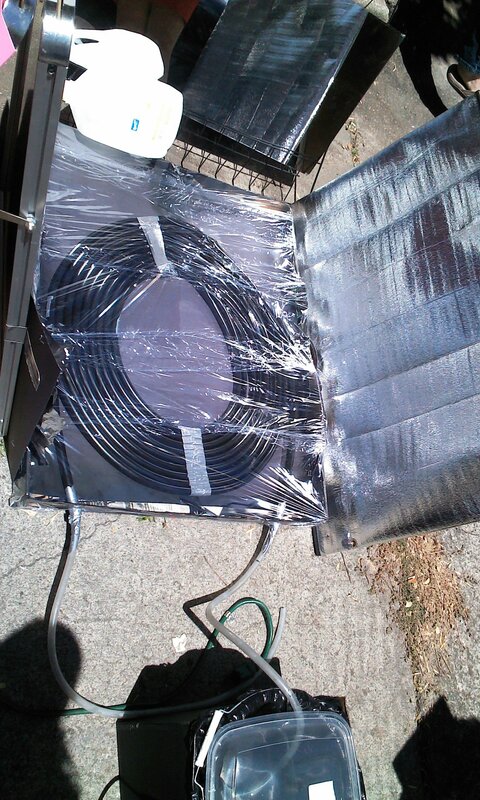 Unfortunately, it worked too well, and our rig melted in the concentrated sun! 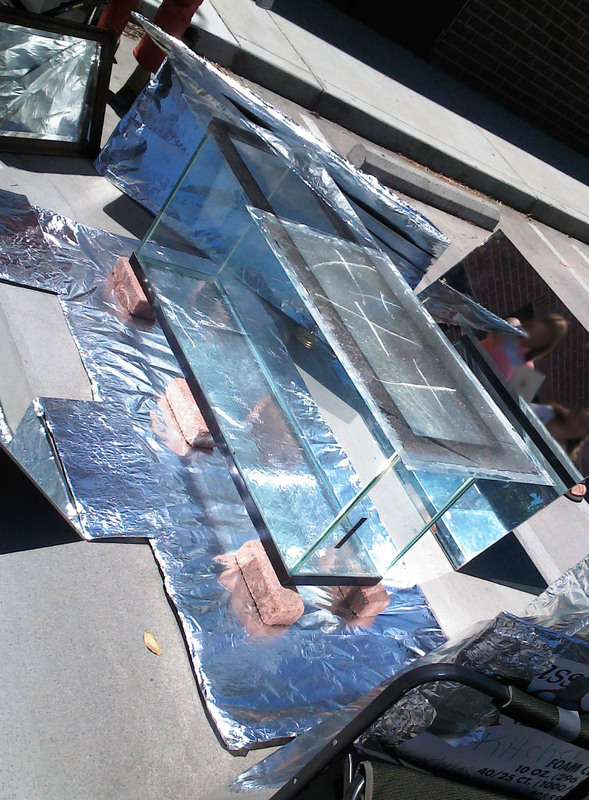 So for our experiment we just used the solar collectors. This was the culminating activity of the week. We discussed our results, and how each rig could be improved, as well as which type would be best suited for large-scale use. We even had a representative from Maker Ed who encouraged our work! 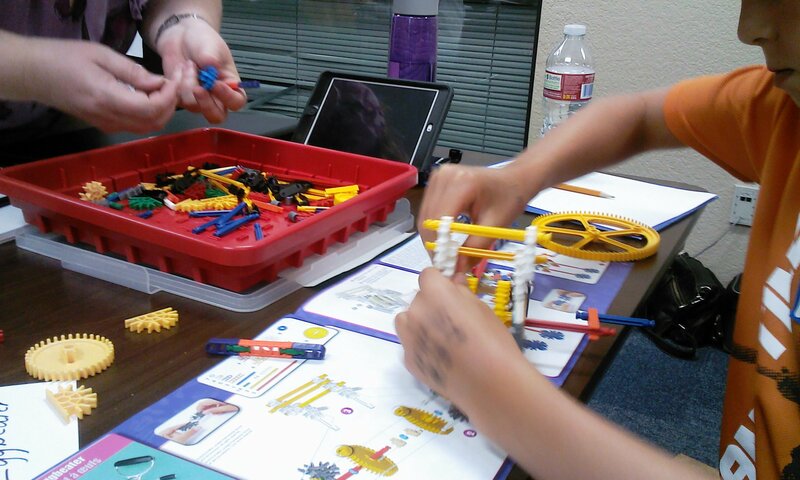 Our second unit was an example of taking one idea and looking at it from different STEM perspectives – in this case, gears. To bring in the student perspective, we had guest learners – kids!! So each group had one third grader. 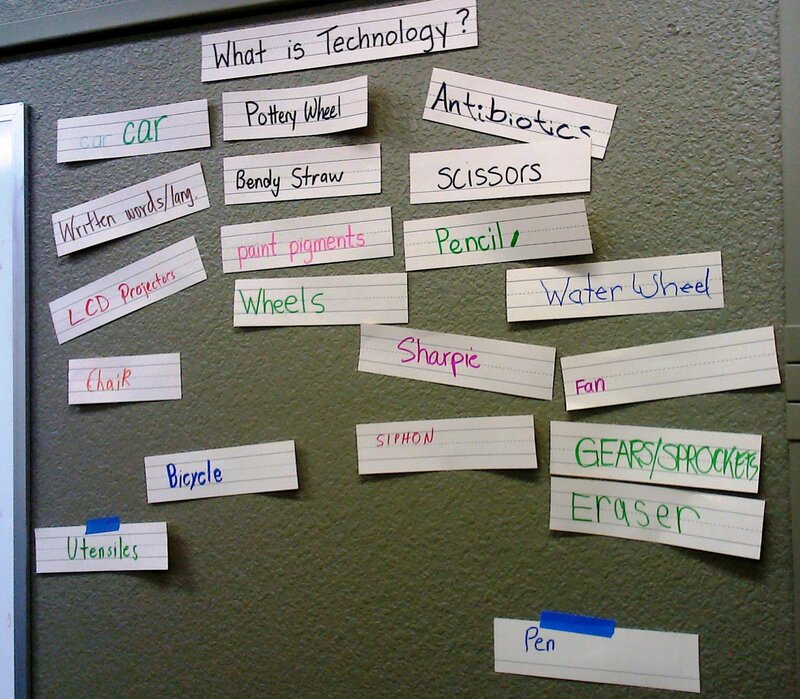 We started with a web quest to answer the question: What is technology? We discussed, and then each of us had to post a unique example of a technology on the wall – no two could be the same. We had some gears to play with to see how they worked. One of the two sets of gears we worked with. We answered questions such as: How can you get one gear to turn another in the opposite direction? The same direction? How can you turn a gear once and have another gear turn twice? Do gears push or pull each other? Find a pair of gears such that if you turn one gear twice, the other gear will turn once. How many teeth are there on each of the 2 gears? Find a pair of gear such that if you turn one of the gears 3 times the other gear turns 4 times. How many teeth are on each of the two gears? How can you mathematically represent the data collected in questions 1 and 2? We looked at different examples of gear driven machines: corkscrew (arm type), bicycle, watch with exposed gears, egg beater, drill, can opener. 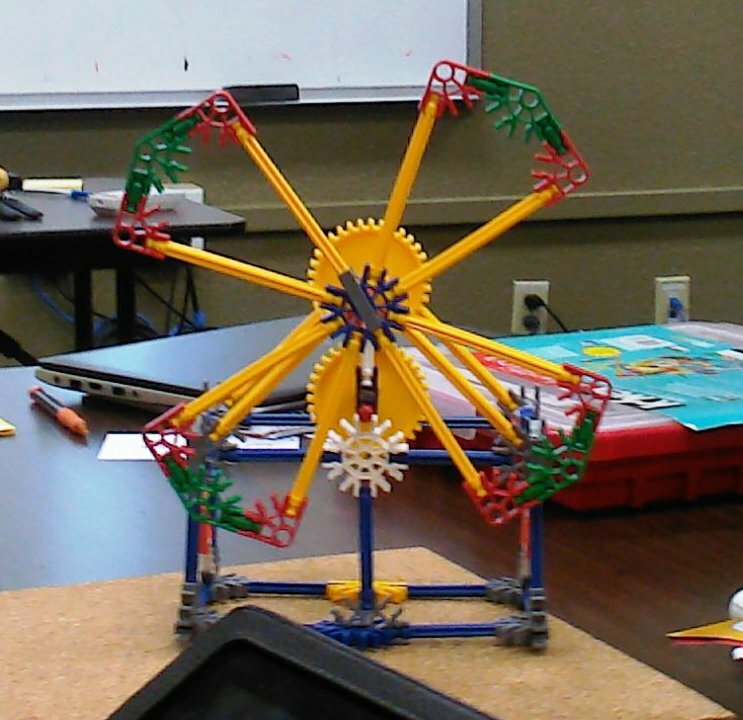 Then, using K’Nex, each group built a gear-driven machine. What is the distance your bike travels in 10 revolutions of the pedal? Then we needed to find the following geometric shapes on the bike: a line segment, a triangle, an acute angle, an obtuse angle, parallel lines, a quadrilateral, a pentagon, and a circle. I love this unit and plan to use in my Geometry class next year once they’ve been introduced to geometric notation. 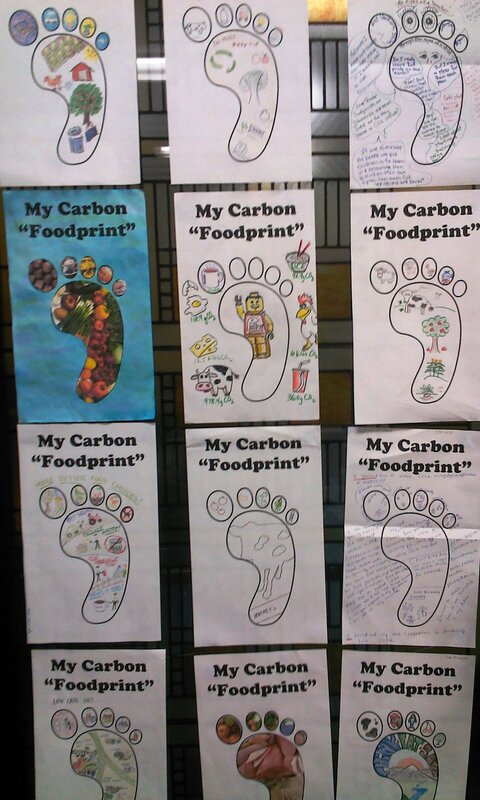 Since Carbon Footprint is such a large topic, we narrowed our focus to Carbon “Foodprint” (the footprint of what we eat). We were given an article to read, jigsawed so that each pair of students just had one part and was responsible for creating three sides in a Google presentation, which was then presented to the class. We did an activity called a Silent Gallery. We were each given an 11×17 piece of paper folded to make a booklet. We labeled the front with the topic, our name and the date, which left seven pages to fill. Each table of seven was given a stack of seven laminated cards, each with some information about Carbon Foodprint. In silence we passed the cards to the right every two minutes, taking notes in our notebook. At the end, we passed the cards to the right again, with each student having two minutes to present that card and their notes. This is a great EL activity, because the cards were full of color, pictures and graphics. It is also engages the less motivated students, because they only have two minutes to make notes. The project portion was about food choices and building a better burger. We started with a hook video about lab grown hamburger. We then read a short article from Scholastic Math about the artificial burger, and were each given three cards on which to record two true facts from the article and one lie. We then went around the room and exchanged cards, to see if our partners could spot the lie (alternately, students could present their cards to the whole class). We then had a lab activity to “Build a better burger” to be judged on four qualities: Appearance, Taste, Texture, and Carbon Footprint. As a class, we designed the judging criteria by splitting into four groups to design that part of the rubric (this was done in a shared Google document so we could all create it together). Now the fun really started: building our burger! We were given an array of foods, such as various canned beans and grains, tofu, and seasonings. We were provided with food processors and electric grills (think George Forman). In groups, we had to follow specific steps: Design what our burger would be made of, Plan our preparation process, Build our burger including cooking, Test each burger, and Report/Reflect on our results and improvements we would make. To test, we each made a burger to be shared with the class, and each group tasted each burger and ranked it according to our rubric. Finally, we each made a footprint poster to summarize our feelings about the unit. What struck me about this unit is how it made the topic of global warming personal. It forced the students to reflect on what carbon emissions mean in terms of the lives we all lead. So this unit was relevant to the students. This also hit all four Cs: Communication, Collaboration, Creativity, and Critical Thinking. At the Da Vinci Center for Innovative Learning.